The following are extracts from the Dogs NSW Gazette that relate to Agility matters. Agility, Jumping and Games rule changes (not including agility equipment changes). Dogs NSW Agility Committee by 1 AUGUST 2016.
regardless of date of manufacture. the first instance. If an agreement cannot be achieved then the objection may be lodged with a Club Official. Any objections must be lodged prior to judging. provided for the Judge. The affiliate is to have a collapsible tunnel, or may borrow for an approved trial. The Agility Committee would like to advise competitors regarding classes and titles. The ANKC Ltd Agility Rule 3.1 clarifies eligibility for dogs to compete in a class. To make is easy for you to understand. title. In Excellent class if you attain 5 passes under 2 different Judges, you must move to the Master class. to the next class, but if unable to be moved a class, they are able to remain in the lower class for that trial only. The Rule does not apply to Masters and Open classes. Competitors found in breach of the rules may be penalised. * Administration Levy $1.00 per entry, excluding Agility Trials. 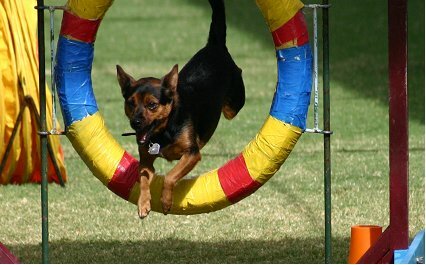 * Administration Levy Agility Trials - $0.50 per entry (effective as from 1 January 2013). This clarification is about changes of class and/or partner after the closing date of a Trial. In the case of Strategic Pairs, the same rule can be applied as stated from the Show Regulations and the ANKC Agility Rule Book. If the Trial Secretary is ABLE to accommodate the request to substitute a pairs partner with an existing exhibit from the catalogue, this is acceptable. A dog NOT already entered in any class in the Trial is not eligible as a substitute partner. ANKC and Dogs NSW Members are reminded that Trial Secretaries work as volunteers. Respect should be shown at all times for their ability to organize our Trials. The Dogs NSW Regulation Part 11-Show, Section 13.4(v) states that "no substitute will be permitted after close of entry". The ANKC Agility Rule 3.1 Classes - states that...."At the discretion of the Trial Secretary, a competitor who completes the necessary passes to a title and applied for that title, after the closing of entry, may request and be transferred to the next higher class." Please consider that some Trial Secretaries have time restrictions and MAY NOT be able to help the competitor in some circumstances. It has been reported to the Dogs NSW Agility Committee that some competitors have been interfering with the equipment and numbers during the course walking period. Competitors are reminded that this practice contravenes Rule 9.16(h) of the ANKC Agility Rules and is to cease. No equipment is to be handled without the permission of the Judge. 3.2.1 All dogs eligible to be entered in Agility Trials in accordance with these rules shall be eligible to receive Title Certificates upon qualification and subsequent application. 3.2.2 The Canine Council will receive application for the use of the relevant title letters after the name of each dog, when the dog has gained a qualification certificate at the following specified number of Trials under the specified number of Judges. 3.2.4 Applications for the Title must be accompanied by the prescribed fee and, upon approval, a Title Certificate will be issued to the applicant authorising the use of the letters and numbers concerned.